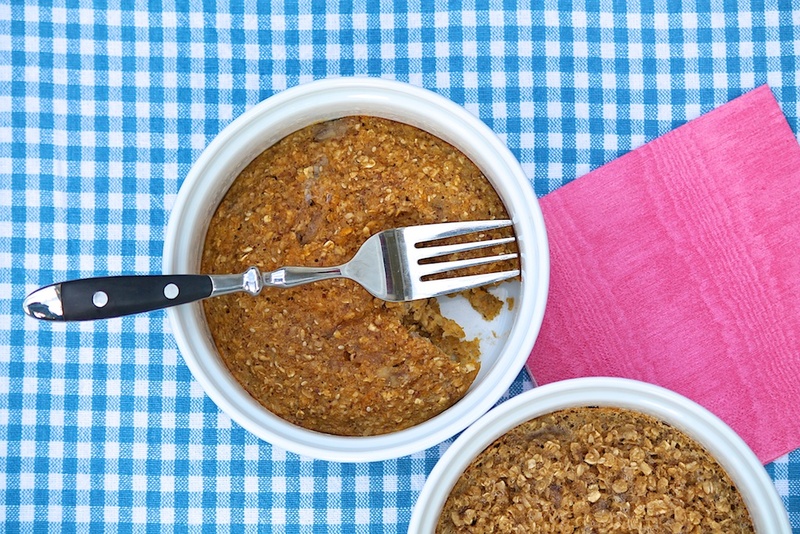 Instant Baked Oatmeal — 4 ingredients with a protein punch! Oatmeal Packet Mug Muffins — Four basic ingredients are all that’s needed for single-serve, protein-rich muffins that can be customized to taste…and they take just minutes to make! When preparing a bowl of stovetop oatmeal or one of my many baked oatmeal recipes, I use regular or steel cut oats. So when I was challenged a while back to create a new recipe using instant oats, I literally spent the better part of three days experimenting and getting creative. I wanted to see how quick, instant, and old-fashioned oats responded to similar ingredients. (There’s an inner scientist in me!) By the way, the nutrition content of all of these options is equal; the difference is how thinly the oats are cut. The first instant oatmeal recipe deemed a winner here was Chewy Almond Chocolate Chip Granola Bars. My kids adore them. 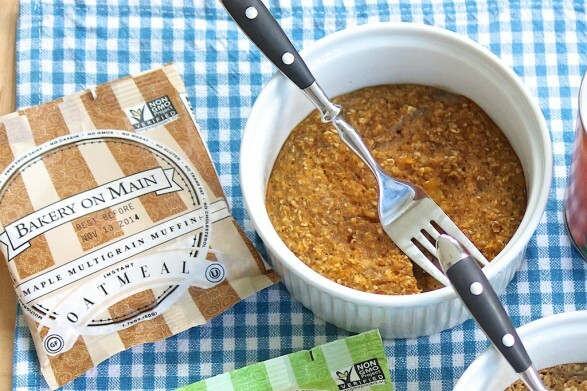 Since I have a fondness for baked oatmeals, I thought it would be fun to make an instant version that also appealed to those who prefer just one serving instead of a panful. The use of a pre-measured packet along with one egg allows for a portion-controlled, high-protein breakfast that tastes great. I like that Bakery on Main oat packets contain ground flaxseed and chia seeds, which provide heart-healthy Omega-3’s and added fiber. In addition to plain oats, they offer flavors like Maple Multigrain Muffin, Carrot Cake, and Strawberry Shortcake. All are low in sugar and certified gluten-free. With many of my recipes, I start basic and then add lots of options and variations. I like to try a recipe several ways before posting on this site. For this recipe, I first wanted to share the basic four-ingredient framework to demonstrate the utter ease of this wholesome breakfast. I will soon follow up with a few fancier versions but, in the meantime, feel free to sprinkle in some dried fruit or nuts and/or use a quarter cup of egg whites instead of the whole egg. Additionally, this recipe provides a healthy breakfast alternative for a child who doesn’t care for the mushy factor of regular oatmeal. (I know from experience!) Sometimes, we eat this breakfast with syrup, like a pancake. Other times, I top it with warm milk, a handful of slivered almonds, and seasonal fruit. My older son likes these individual oatmeals as an after-school snack with a spread of peanut butter and sprinkling of raisins. (Almond butter and banana slices are delicious, too.) You can even dress them up by using the brown sugar “crunchy top” trick I employ in a few of my original baked oatmeal recipes. (Click here for an example.) I recommend starting with the first four ingredients to get a feel for this speedy meal. Then have a go at modifying to suit your taste. The microwave option makes these a cinch to whip up although the conventional oven method does offer a slightly better texture. When microwaving, it is easier to overcook, so check early the first time as all microwaves cook a little differently. When baking, I often prepare several at once. After cooling, cover and store at room temperature overnight or in the fridge for 4-5 days. I like to gently reheat before eating. In a medium bowl, mash the banana (if using) with a fork or add the pumpkin. Whisk in the egg, the maple syrup or honey, and baking powder, and then stir in the oats until thoroughly combined. Top as desired and enjoy a speedy, whole-grain, protein-rich breakfast! If you wish to drizzle syrup over these, you may omit the sweetener altogether prior to baking. When using flavored packets, I’ve been omitting it entirely and don’t miss it. Conversely, if you wish to eat the baked oatmeal plain, you may prefer to increase the amount of maple syrup or honey to 1 tablespoon. After making these once, you can easily adjust the sweetness to the amount that’s perfect for you. We just had them for breakfast here, Kelsey. Thanks for the comment and so glad they are a hit! These are excellent! Love your website! Another one I need to try and I am going to look for these instant oats! These really make a fun and easy breakfast, Mary Lou. Hope you like! Great idea. I look forward to baking these with nuts and dried cranberries. Hey, can you clarify the baking time in step 3? I was trying to explain that the cooking time will vary based on the size of ramekin or baking dish you choose, if you add fresh or frozen fruit (which adds more moisture than dried), etc. The first time you make these, just check a few minutes early and add time as needed. You will be fine! Would you have the calorie count for this 4-ingredient recipe? 🙂 thank you! Hi Hil, This specific brand and flavor of oatmeal has 200 calories (although another brand, similar flavor, has 160) and an egg has about 75 calories. Pumpkin puree adds negligible calories; banana about 50. I’ve been making without added sweetener recently and don’t miss it at all. Hope that helps! Oh, I’ve also been adding a 1/2 teaspoon of baking powder lately, because I think it provides a nice rise and better texture. I will add that to the recipe but wanted to mention here so you were sure to see.